McCaughan (nee McAllister). April 11th 2019 peacefully at her home, 185, Whitepark Road, Bushmills, Vera, dearly loved wife of Frank, much loved mother of William and Rebecca, mother-in-law to Charmaine and Jason and very dear granny of Jonathan and Eli, beloved daughter of John and Isobel and dear sister of Marlene, Lorna, John and Frances. Funeral from her home on Sunday at 2.30pm to Dunseverick Parish Church for Service at 3.00pm, burial afterwards in the adjoining churchyard. 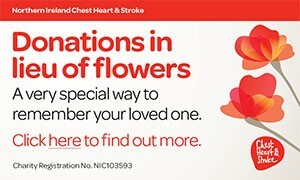 Donations in lieu of flowers, if desired, to Dunseverick Parish Church Building Fund c/o DJM Robinson & Son 121, Culcrum Road, Cloughmills BT44 9DT. I am sorry to tell you that Vera McCAUGHAN has passed away.